Just like your diary view a day at a time and click other operators to see their days also. Simply click on a job to move it or view the details. At a glance see the total $ of jobs on any day of the month. Click on a day to bring up the diary. 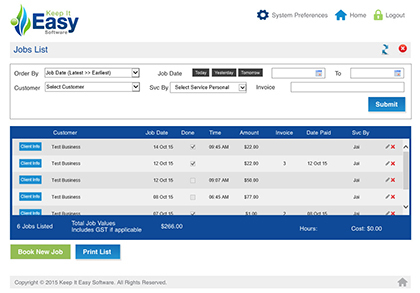 Print your run sheets at a click of a button, take payments, invoice and more, all from this screen. 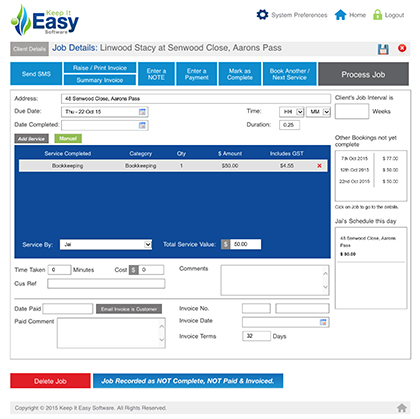 This screen can be access from numerous places in the software, from here you can change details, invoice, sms, email invoices, enter payments, enter notes and automatically book future jobs, as well as viewing other work on that day for that operator and other jobs for that customer that haven’t been marked as completed. The customers accounts status is also shown with any debits or credits being displayed. All the essential information easily searched using the boxes at the top of the screen. Click on the line you want opens the details for that job. 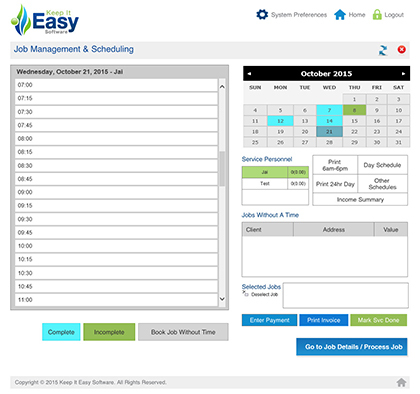 Set the order you want to view the jobs in using the drop down box at the top of the screen. If there’s more you need or an easier way to do it… let us know!